Social engineers build relationships and take advantage of the human tendency to be open and helpful, all in an effort to steal data, access confidential networks, and run other scams. This mobile-responsive module goes beyond the phishing threat and explains the dangers associated with smishing, vishing, social media, and in-person attacks. 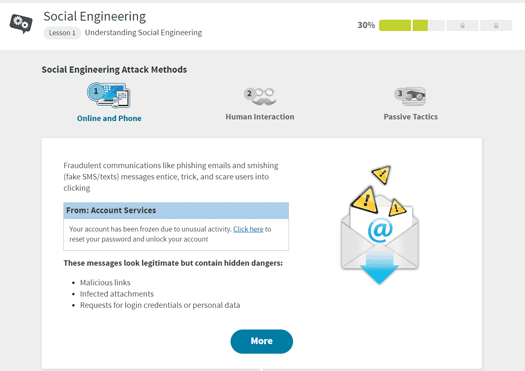 Your employees will learn how to recognize and avoid common social engineering techniques and keep your people, areas, and assets secure.